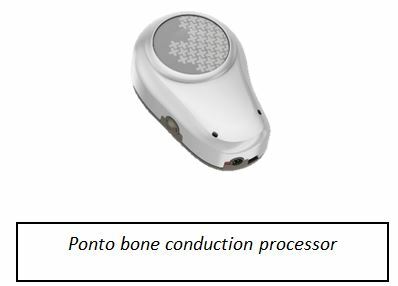 What is a bone conduction hearing device? 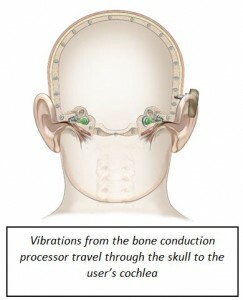 A bone anchored hearing device is a sound processor that picks up signals in the air and transfers them to vibrations that travels to your cochlea through bones in your head. The sound processor attaches to a small titanium implant and abutment which is surgically implanted by your doctor. Bone anchored devices can also be used on metal head bands or elastic soft bands. Approximately 8000 people receive a bone conduction hearing device each year in the US alone, however awareness about these products is still low compared to hearing aid or cochlear implants. Who can use a bone conduction hearing device? Simply put, a bone conduction hearing device is sometimes a solution for people who cannot be helped by traditional hearing aids. Conductive hearing losses which are too great for traditional devices and medical conditions, reoccurring ear infections or absent ear canals (atresia) are common conditions where bone conduction hearing devices may be a good solution. Also, in the cases of severe to profound unilateral hearing loss, also known as Single Sided Deafness (SSD) a bone conduction device can be used to send auditory signals from the hearing impaired side of the head to the contralateral cochlear via bone conduction. Ponto sound processors can be worn on a comfortable, head-worn Ponto soft band. This solution will improve you or your child’s ability to meet most everyday challenges and to acquire a hearing solution that supports them in developing language. Specifically designed for individuals who cannot be assisted with conventional hearing aids – or who are too young to undergo implant surgery – a Ponto sound processor attached to a Ponto soft band is a flexible, convenient solution. Adjustable and elastic, the soft band fits any head size. Even newborn babies can wear it. 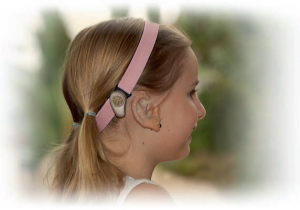 The Ponto sound processor is easily attached to the Ponto soft band and allows the processor to be placed in the optimal position for comfort and hearing. The Ponto sound processor picks up sound and converts it to vibrations. 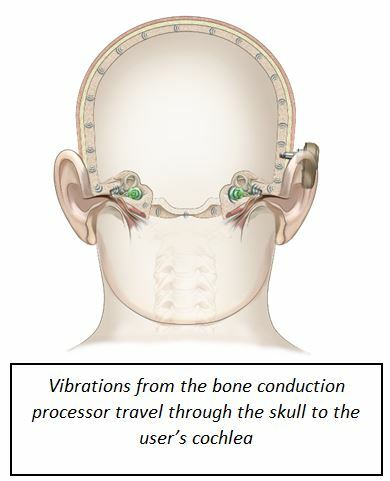 These vibrations travel via the Ponto soft band connector to the bone and on to the inner ear. Most users adapt to the Ponto soft band very quickly. The soft band comes in six different colors. A range of stickers are available to make the Ponto sound processor more fun to wear. And if you or your child needs two processors, you can get a special headband just for that. The Ponto soft band is designed with safety in mind so users can live a normal, active life. A simple safety feature ensures that the Ponto soft band comes undone if it should happen to catch on anything. A discreet safety line can be attached to secure the processor. Furthermore, the Ponto sound processor has a tamper-proof battery door that prevents small children from getting access to and possibly ingesting the battery. By acting as a bridge to the world of sound, the Ponto sound processor and the Ponto soft band empower users to interact, participate and learn from their experiences. Oticon Medical combines long experience in bone conduction solutions with the vast sound processing expertise of Oticon – one of the world’s leading manufacturers of conventional hearing aids. This unique combination empowers us to help users of bone conduction systems hear considerably better– from childhood and for the rest of their lives. Ponto and Ponto Pro devices both have a direct audio input and can ONLY use the R2 BA receiver (has three pins of equal size – not the Europin or Roger X). Use with an Oticon FM system is simple and seamless. There is no Phonak Roger receiver compatible with these devices. If you decide to use a Phonak system, you will need to use FM with the MLxi BAHA. Ponto Plus and Ponto Plus Power devices have no direct audio input and must be set up using the Oticon Medical Streamer for FM/Roger. The standard R2 receiver (three pins, one is large; Europin) is required to plug into the streamer. Phonak Roger X receiver is compatible and can be used with the streamer for these products. As per Oticon, it is possible to go into the Oticon Streamer settings on the computer to make the FM system default. This is recommended as otherwise the child will need to push and hold the button on the bottom of the receiver to activate use. Supporting Success wishes to thank Oticon Medical for making this information available to teachers! Posted January 2015. Updated March 2016.